The 23rd Woodford Folk Festival presents a resplendent program of 580 acts and 2600 performers. Festival Director and futurist, Bill Hauritz says “it’s our most ambitious programme in our 23 year history…”. The festival runs from Thursday the 27th December through till late on Monday the 1st January. Featuring some of the planet’s finest artists, Woodford Folk Festival truly represents our modern Australian culture and The Queensland Folk Federation is representative of a dynamic community of 2000 volunteers, 160 department heads and 20 full time staff who create the festival. Negotiating the balance between community and professionalism is a rewarding challenge for all involved. Woodford Folk Festival has become known as an incubator of fresh talent and it’s not just musicians who are nurtured at Woodford, there are platforms for visual artists, comedians, circus, vaudeville, healers, environmental leaders and for patrons through workshops, forums, volunteering and performance involvement. The 360acre site is also being lovingly regenerated. This years highlights include festival favourites such as Lior, John Williamson, Dya Singh, Doch, Katie Noonan, Ash Grunwald, Augie March, Katie Miller-Heidke, Katie Noonan, Josh Pyke, That 1 Guy, Kristina Olsen, Waiting For Guinness, Backsliders, The Bird, Jeff Lang, Alistair Hulett and David Rovics, Martin Pearson, Wild Marmalade, Ernie Dingo, The Herd, Miguel, Leah Cotterell, Mr Percival, Bluegrass Parkway, Mic Conway¹s National Junk Band, the Amazing Drumming Monkeys, and Oka. Also there’s the captivating Mama Kin and a solo appearance by Harry Angus, the Cat Empire¹s trumpeter and vocalist who this time will bring his guitar. From overseas come KoPAS to perform their magic on the lake, multi-instrumentalist Asim Gorashi from Sudan, horse-head fiddle player Baatarsukh Batsukh from Mongolia, singer Grace Barbe and her reggae/afro-funk band from the Seychelles, legendary singer-songwriter Dougie MacLean and the poetically raw pop-rock band Frightened Rabbit, both from Scotland. This year festival director Bill Hauritz and general manager Amanda Jackes will present the Woodford Chronicles and an outline of the 500 year plan to be further developed via community consultation and a series of open forums at the festival. The festival streets will be lined with more than forty cafes and restaurants and 160 vendors. For the thirsty there are a dozen bars to choose from and for the brave; street theatre clowns Wacko and Blotto. For body, mind, soul and planet, the great green debate continues with forums that build our resilience and elevate our vision. Philip Sutton and David Spratt authors of Climate Code Red, suggest that there is a case for emergency action. ABC Gardening Australia’s Jerry Coleby-Williams will present ‘Bellis’ his sustainable home and Australia’s leading health care specialists will be at The Blue Lotus venue. Radiance 6, the wellness festival, has a theme of self empowerment. All up, there¹s a lot to digest in the 08/09 programme and the above is just a taste of what’s to come. 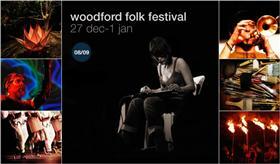 Woodford Folk Festival is an experiential delight, a perfect place to celebrate the festive season. Come along and be part of it.